Bad news for our public universities. It didn't get much attention beyond his blog, but Mark Hebert of WHAS-11 has reported survey results from Survey USA that show that a large majority of Kentuckians oppose benefits for the partners of unmarried gay state workers. Should unmarried state workers be offered health insurance for their gay live in partner? Less gay hating. 9% of Kentuckians want to ban domestic partner benefits. Only 9%. But 34% say health insurance for children is their top priority. Ruh ro, Mitch. You may be on the wrong end of another issue. Oh, and the state legislature is crappy as always. First of all, there is the not so implicit assumption that just because you don't think unmarried relationships should be encouraged by state institutions that therefore you hate the people involved them. As I keep pointing out (am I blue in the face yet? ), just because you disagree with someone doesn't mean you hate them. But more importantly, by what logical procedure do you conclude from the fact that only 9 percent of Kentuckians listed domestic partner benefits as one of their top issues that only 9 percent of the people oppose these benefits at all? Who would expect the issue to be one of the top two for most people anyway, no matter how many people oppose it? But I guess I should be careful. I wouldn't want to be accused of hating people who misinterpret statistics, would I? The forces of intolerance have lost an important battle. The people who want to impose their values on everyone else and suppress the expression of unpopular opinions got waxed in an important legal decision Friday. That's right. For years we have been warned about the groups that want to take this country over and force everyone to bow to their political agenda. We have been told about these groups: the right wing extremists who want to establish a theocracy and stamp out all dissent from their ideology. No. This can't be right. The ruling says that the people being intolerant and imposing their opinions on other people may be precisely the ones who are always lecturing the rest of us about being intolerant and imposing our opinions on other people! As it turns out, the ruling isn't a blow against the forces of the right, who we have been assured for years are the real danger to freedom of thought and expression, but political forces on the left, who are always spouting off about Tolerance and Diversity. The 2-1 ruling by the U. S. 6th Circuit Court of Appeals overturned a lower court's ruling that struck down Timothy Morrison's petition for damages against Boyd County School district's "written policy prohibiting students from making stigmatizing or insulting comments regarding another student’s sexual orientation" during the 2004-2005 school year. The suit was originally brought against the school by Morrison, who argued that the policy would result in a "chill" on the free speech of students who thought that homosexuality was wrong, and asked for damages. The ruling did not have directly to do with the issue of the "diversity training" itself. That issue had already been settled by the school district itself, when it tacitly admitted the inappropriateness of it's policy mandating students undergo pro-homosexuality training at the school. Students can not opt out of the mini-reeducation classes to correct the thought crime of having traditional views about sexuality. But the Appeals Court ruled that the lower court was wrong in denying Morrison damages. This case was so blatant that even the ACLU has been on Morrison's side. So for now, at least, students in Boyd County have some protection against the Tolerance Police, who are intent upon ensuring that unflattering thoughts about homosexuality do not get expressed, particularly in an educational context where students might infer from the fact that the First Amendment's freedom of expression protections are supposed to apply to everyone that they should therefore apply to people who disagree with the political and cultural agenda of gay rights groups. At least there are a few judges who comprehend that "everyone" includes everybody. But it won't stop the attempts by gay rights groups to get their political views mandated in schools. Next on the agenda: the bullying bill, which is being pushed by the same crowd. Watch for it next January in Kentucky's General Assembly session. The Religious Roots of “Child‑Centered” Education by E.D. Hirsch, Jr.
Modern “progressive” education is based on discredited 19th century romanticism, not good pedagogy. It is ironic that when man began the modern adventure of constructing a world without God, he thought he could know everything. He has ended up deciding he can know nothing. G.K. Chesterton once said that superstitions are most prevalent in rationalistic ages like our own. The language of the Romans reflected their character. The rise and fall of the Progressive Education Movement is a cautionary tale that explains why education reform in the United States has never worked. These simple and few rules will help make sure your Latin students pay closer attention in class. J. K. Rowling is wrong. Albus Dumbledore is not gay. How, you ask, can someone say that? Hasn't Rowling herself, the author of the Harry Potter books--albeit in a fit of political correctness, and to a New York City crowd--pronounced the venerable wizard, Headmaster of the Hogwarts School for Wizardry and Witchcraft, ... well, a switch-hitter? They are her characters, after all. Can't she do with them as she pleases? If Rowling says Dumbledore is gay, then gay he is: right? Rowling made the remarks to a crowd of fans at Carnegie Hall, who were there to hear more about their favorite children's literary character. And in addition to the revelation about Dumbledore's heretofore unknown monoclinousness, Rowling apparently threw in a few politically correct moralisms. It is a long established principle in literary criticism that once the author has released his work upon the world, the story is as much the reader's as the author's. In their 1954 book, The Verbal Icon, W. K. Wimsatt and Monroe Beardsley authored an essay entitled "The Intentional Fallacy," in which they pointed out the problem with the idea that a work of art should be judged on the basis of the author's intent. In the same volume, they penned another article, called "The Affective Fallacy", which took on the opposite error--that a work is to be judged by one's subjective reaction to it. A work of literature is not what the author intended nor what the reader sees in it. It is what it is. Neither the reader nor the author has any privileged status in judging the meaning or assessing the characters. The only basis on which to interpret a piece of literature is on the basis of what it says. Does it say anywhere in the Harry Potter books that Dumbledore holds the dictates of biology in low esteem? I have posed this question to a Harry Potter expert. A person who has read all of the books--several times. A person so steeped in Potter lore that he can tell you which spell is for what, and what original Latin expression it comes from. A person who, when his mother looked out of her kitchen window some two or three Halloweens ago, was beheld prancing around the back yard in a dark robe casting spells on every thing within notice (much, we are fairly certain, to the horror of the Baptist pastor who lived next door). He is my 12 year old son. The youngest of my young 'uns. I caught him idle one day (not an uncommon occurrence), munching on an ice cream sandwich. I asked him, "Tell me," I said, "is Dumbledore gay?" "No," he said, between bites. "That's stoopid." Now the thing is, his opinion on this topic is every bit as authoritative as Rowling's. In fact, it might be even more so. It is a common notion that a reader can often see more in a story than the author intended. J. R. R. Tolkien said as much about his books, and William Golding once remarked about the fact that readers of The Lord of the Flies had been able to glean things from the book that he, the author, never knew were there. If it is possible for a reader to see more in a story than the author intended, then it must a fortiori be possible for a reader to see less. Rowling also advised her audience during the Carnegie Hall appearance that they should "question authority". Well, now we are questioning hers. If Rowling had intended for Dumbledore to be gay (and it wasn't an afterthought, as I think more likely), then she left the intention inside her head (where it should have remained) and it never made it into the story. From now on Rowling ought to keep her thoughts about Harry Potter to herself. She obviously doesn't know what she is talking about. Note: As I go to press with this little piece, I catch on my feed reader an article with the title I had intended to use, and which made many of the same observations I make here: "Dumbledore is not Gay: Taking Stories More Seriously than the Author." I'm hoping it is because great minds think alike. There is simply no other adequate response to the self-flagellation now being administered by the University of Kentucky to itself than sheer amusement. Recently the student newspaper at the University of Kentucky (the Kentucky Kernel) printed a cartoon that used images of slavery to make a point, after which, someone pointed out that the image was insensitive to blacks. The ensuing fit of mea culpas and the public confessions was followed swiftly by promises never, ever, ever to be so insensitive again and to more strictly observe Diversity in the future. What does Diversity have to do with squelching anything, much less insensitivity? Wouldn't we, if we were really practicing Diversity, be allowing for such cartoons--whether they violate someone's idea of what is right and wrong or not? In every dictionary I know, the word "diverse" is synonymous with "heterogeneity" or "variety". If we were really practicing Diversity, wouldn't we allow for such opinions to be expressed, no matter how objectionable they were? So how does Diversity get invoked in a process of limiting what can be thought or said? Well, anyone with the least familiarity with Newspeak knows how: you simply redefine words. Liberals, you see, have certain shibboleths which must go unquestioned. One of these is Tolerance, the other is Diversity. We must never, ever, be intolerant--except, that is, when some person or idea that has special protected class is offended. At that point we violate the first of these, Tolerance, and cover our posteriors by invoking the other, Diversity. It's a sort of shell game using two shells: when we want to limit opinions with which we disagree, we violate the idea of Tolerance, and say we are doing it in the name of Diversity. And when we go against Diversity by limiting the opinions that can be expressed in regard to those groups or ideas we think ought to be protected, we invoke Tolerance to justify it. We've gotten so good at it now that we don't even recognize it ourselves. And after all, isn't this one of the purposes of Newspeak? To so change the language that thought crimes cannot be committed at all because you will no longer have the vocabulary to commit them? I haven't seen the cartoon, so I can't judge whether it was offensive or not. I'm going to assume it was. But I wonder, was it any more offensive toward blacks than some other cartoons at the Kernal (or the Lexington Herald-Leader) have been toward other groups toward which they have less sympathy, like conservative Christians? In that case, intolerance is justified, and limits to Diversity are strictly enforced--all by the neat little trick of calling intolerance Diversity and lack of Diversity Tolerance. Winston Smith would have understood it all very well. Okay, it has been pointed out to me that there is a third member of the liberal media establishment who is going to need a safehouse. A third political journalist who just doesn't know when to keep his trap shut and who has broken the deafening silence on the fact that Steve Beshear's campaign has pronounced two Louisville men "man and ...," well, "man." Another newsman who, as a consequence of his indiscretion, will have to have his identity changed and have his family moved to a little town in Utah somewhere to avoid persecution by his journalistic colleagues who seem hell-bent on deep-sixing the Beshear gay marriage gaffe. I wish him well--and his family too, and hope he enjoys the desert climate. David Hawpe, editorials editor of the Louisville Courier-Journal, informs me that if I am going to mention that he was the one who announced to the world that the Louisville Legal Aid Society was distributing "do-it-yourself" divorce kits (as I did on a post about the fact that an architect of these kits held a Beshear fundraiser) I ought to at least mention that he also did a column on the Beshear gay marriage flap on October 12. Is he out of his mind? He wants me to publicize this audacious violation of the unwritten journalistic gag rule on this issue? Actually, I think he was being just slightly facetious (as is his wont), but at the same time he's right. My bad. I just missed it. In fact, as we now go to press with this, I have viewed Monday night's gubernatorial debate, and seen with my own eyes as Pat Crowley of the Cincinnati Enquirer actually brought it up in a question to the candidates. I'm putting the state's liberal media down for 3 1/2 stories: one slightly misguided news article in the CJ, one passable television report by Mark Hebert, and one CJ editorial--all of which, by the way (with the possible exception of Hebert's report), treat as controversial, not the fact that Beshear categorized two gay men as "married", but that Fletcher released a press statement on it. The 1/2 is Pat Crowley's question during the debate. So I'm thinking now with 3 1/2 stories on this issue, that probably counts as "covering the issue." But it is interesting how the Beshear gaffe has been covered. Namely, it hasn't been covered as a Beshear gaffe, but as a Fletcher gaffe! In other words, three articles have covered the story, but, for the most part, the "story" was not that Beshear's campaign had deemed two men "married", but that Fletcher had pointed it out! And Hawpe's article was an assault on the Fletcher campaign for "gay-bashing"--but at least he mentioned it. It just now occurs to me that I am sitting here, late at night, counting it as points in the liberal media's favor that they ran an editorial attacking the conservative candidate. Beshear's Bad Company II: Did an architect of "do-it-yourself" divorce kits in Louisville host a Beshear fundraiser? Pssst! Hey, I'm going to point something out, but only on one condition: that you don't tell anyone in the state media. You see reporters and editors who cover state political issues have to be feeling pretty bad about the fact that, with two lonely exceptions, they didn't report the biggest gaffe of the gubernatorial campaign: that Steve Beshear's campaign designated a gay couple as "married" on an official campaign finance report in a state in which supporting gay marriage is about at politically disastrous as..., as..., well we can't think of anything as politically disastrous as that in Kentucky. If we tell them about this one, it will only give them one more important fact about who Steve Beshear hangs with that they will refuse to report. And that will only make them feel worse when they wake up the day after the election and realize they were running interference for the Beshear campaign on social issues. And we don't want to rub salt in the wound. Well, okay, we really do. 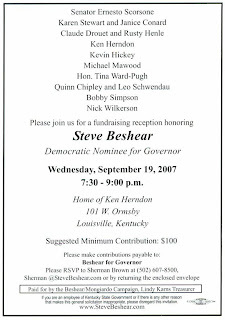 Two gay men, Jeffrey Been and Eric Graninger hosted a fundraiser for Beshear on October 2nd in Louisville. Been is the Executive Director of the Louisville Legal Aid Society and Graninger is an attorney for the Presbyterian Church USA. Isn't the Louisville Legal Aid Society the group that is handing out "do-it-yourself" divorce kits? Well, according to David Hawpe, Editorials Editor of the Courier-Journal it is. Last month, I opened the Courier only to find my name invoked in Hawpe's column, asking why I wasn't doing something about the Louisville Legal Aid Society's "do-it-yourself" divorce kits. Now, low and behold, the head of the organization dispensing the kits to make it easier to end marriages in Louisville is apparently hosting Beshear fundraisers. Oh, and another thing. Remember too that there is no connection between the support of gay marriage and a lower regard for marriage itself. So the fact that one of the members of the gay couple who hosted the fundraiser for Beshear also heads an organization that makes ending marriage easier is completely coincidental. Just ask a state political journalist if you don't believe me. My "Notice to Lexington Herald-Leader Employees" ran, interestingly enough, in the Lexington Herald-Leader today. Is the media freeze on Beshear's gay marriage gaffe beginning to thaw? The Kentucky media, which has been using every excuse in the book not to cover the biggest gaffe in this year's governor's campaign may be slowly coming around. In addition to today's story in the Louisville Courier-Journal, WHAS-11 TV's Mark Hebert has now run a story on the issue quoting Gov. Ernie Fletcher on the Beshear campaign's inclusion of a gay couple in a campaign finance report labelled "married". But there are still no stories on Beshear's gay-sponsored campaign fundraiser with people who were part of the left-wing coalition that fought the Marriage Amendment. And no word yet from the Lexington Herald-Leader, which is still sitting on both stories. I have this theory about news. It goes like this: any news story about which there is controversy over whether it is a story is a story. The Kentucky media is still largely in denial about whether Steve Beshear's listing of a gay couple on a campaign finance report as "married" is a story. The issue has now been batted around on the Internet by just about every major state reporter. So far, the controversy has garnered only one pitiful little news story in the Courier-Journal. [UPDATE: Mark Hebert at WHAS-11 TV in Louisville also finally ran a story this weekend] The rest of the state's reporters are sitting at their desks with their noses in the air writing long-winded and nonsensical web posts about why the story doesn't warrant the same amount of time they are now spending writing about why they shouldn't write about it. So far, only two reasons have been offered for not reporting about it. The first is the argument that the Fletcher press release overstated the case. Did the Fletcher campaign exaggerate a little by saying that Beshear "violated the constitution" in listing the two men as married? Maybe or maybe not. It is unclear how the second clause of the marriage amendment is to be interpreted. I say that, and I'm the one who originally wrote the amendment language down on a little piece of yellow paper and brought it in to a legislator to file as a bill. The rest is history. The courts, for good or ill, will be the ones who decide whether what Beshear's campaign did was constitutional or not, and any reporter who says he knows is blowing smoke. Whether Beshear violated the Constitution is not the issue anyway. All that matters is whether, on Beshear's campaign finance form, his campaign listed two men as being married. That's all. If it did, then that is about as official a statement of where Beshear stands on the issue of gay marriage as you can have. The second reason, and this is Al Cross's argument, is that "an entry in a finance report does not an issue position make." I have already addressed that argument, but suffice it to say that that has never stopped reporters before. So why is it stopping them now? There have been plenty of stories on campaign finance reports before, so why not one about this one? In fact, newspapers commonly run stories simply listing the contributors when there is nothing particularly remarkable about them. There are stories on the finances of candidates when there is no story. So why is there no story on the finances of this candidate when there is a story? QUESTION: Why should the Fletcher campaign have to file a press release to call attention to this in the first place? Where are the intrepid investigative reporters culling through campaign finance reports looking for a story--and finding one in an official campaign finance report listing two men as married in a state that experienced a political earthquake on that very issue just three years ago? ANSWER: They are sitting at their desks writing stories about why they shouldn't write those kinds of stories. Yo. Joe Gerth, Pat Crowley, Mark Hebert: Steve Beshear says on an official, written campaign document that two men are married. It was signed, sealed and delivered to the Registry of Election Finance by an official in the Beshear campaign. The statement puts one candidate in this governor's race officially at odds with how 75 percent of Kentuckians voted on a constitutional amendment on which more Kentuckians voted "yes" than voted "yes" or "no" on any other constitutional amendment in Kentucky history. If a reporter thinks that is not a story, then he is making a political, not a journalistic judgment. I have spent some time around the folks who populate the state's media. They are competent, decent, interesting, and genuinely nice people, which is one of the reasons that, in my 15 years doing work that has brought me into frequent contact with reporters, I have never openly accused the Kentucky media, in whole or in part, of being biased. I admit having thought it a few times, but with very few exceptions I think they try to be fair and balanced in what they do. This is the reason this whole thing really surprises me, and why I say, reluctantly, that this is the most outlandish case of journalistic bias I have seen in the Kentucky media in 15 years. MEMO TO KENTUCKY REPORTERS: Guys. This is your job. You know it, and so does everyone else. This is a major campaign gaffe by a gubernatorial candidate in a general election. Get on the stick. If the Kentucky media doesn't cover this story, then it will be right in one sense: all of this won't be about what Beshear did; it will instead be a story instead about what the media did--or, more to the point, what it didn't do. No. It can't be. Not Al Cross. Not my favorite state political analyst! Yet, I must face the ugly truth: he too, Al Cross, has succumbed to GCS--Gay Controversy Syndrome, the disease that continues to spread uncontrolled throughout the media community. He too is showing symptoms, albeit mild ones (even when Al succumbs to a dread political disease he sounds dispassionate and analytic. What a guy). I personally am hoping he comes through this and experiences a full recovery. "I'm with Osi on this one," he says, in a comment on my previous post about the disease that is causing more and more state journalists to experience feelings of outrage and disgust over the common campaign practice of pointing out who is supporting the other guy. The catalyst for the outbreak was a press release by the Fletcher campaign that pointed out the support in the gay community for Steve Beshear. GCS causes otherwise sensible members of the media to have a violent reaction to conservative candidates who point out left-wing special interest support of their liberal opponents. It attacks the center of the brain that controls the political reasoning process that would otherwise make the victim conscious of the fact that, if the tables were turned and a liberal candidate was pointing out right-wing special interest support of a conservative candidate, they would think nothing of it. An entry in a finance report does not an issue position make. I believe most if not all reluctance to spend time on such a story relates to its relevance and importance, not any bias. Reporters aren't perfect, and no one can be purely objective, but ascribing political or ideological motives to news judgments is usually specious. See what I mean? You can see the initial symptoms, but he's still incredibly lucid despite his affliction. You can't help but admire the guy. Al argues that just because the names of gay couples appear on Beshear's campaign finance reports, that does not constitute an official issues position. Which is true as far as it goes. But no one said that it was an official position of the Beshear campaign. The fact is that is a common and acceptable practice for officials in one political campaign to point out individuals who are involved in casino interests, or who are prominent trial lawyers, or who are in the oil and gas industry who were contributing to their opponents campaign. And for them to draw conclusions about where they might be on these issues. It is done all the time and no one bats an eyelash, but since it is an issue concerning gays, somehow it is considered out of political bounds. One of the symptoms of GCS is the tendency to see gays as a special protected political class, criticism of which elicits violent feelings of outrage and indignation. He also argues that the reluctance by reporters to spend time on such a story is not an indication of bias--another sign of the progress of the disease. I was not commenting on the reluctance of reporters to to cover the issue; I was commenting on their enthusiasm in expressing their outrage over the Fletcher campaign bringing it up. Pat Crowley was not reluctant about anything. He said, "the Fletcher campaign is hitting a new low in gay bashing." When, in 2001, now Sen. Perry Clark spoke at the invitation of a militia group, a common right-wing punching bag for the liberal media, he was pilloried in the press, despite the fact that he never himself expressed any official position on the positions espoused by the group. So what is the difference between that and Beshear attending fundraising events sponsored by gays, a prominent left wing presence in state politics? And what would the media have had to say if members of militia groups were holding fundraising events for a politician? The only difference is that one of these cases makes a conservative look bad and the other makes a liberal look bad. That is the single and only difference. I'm confident Al would have seen this had his case of GCS not gotten the foothold that it has. If some of you other Al Cross fans would like, you can join me in a candlelight vigil outside the KET offices during the next taping of "Comment on Kentucky," where together we can sing songs of encouragement for Al to come back to his senses. A potentially serious political malady is claiming an increasing number of victims in the state press corps after the Fletcher Campaign released a press statement calling attention to public support being expressed by gays for Steve Beshear. Called "Gay Controversy Syndrome" (GCS), the first symptoms were reported by Pat Crowley of the Cincinnati Enquirer, who began experiencing a politic form of nausea often felt by liberals when issues damaging to Democratic candidates are brought up by conservatives. WHAS-11 TV’s Mark Hebert reports experiencing similar symptoms after having received the Fletcher release. Well someone go get the smelling salts. It looks like we're going to need to revive a few liberal reporters in the state's media who are shocked, so shocked that the Fletcher campaign would point out that Steve Beshear is receiving explicit, and apparently welcome support from gays. In all his years covering politics, Pat Crowley, cheeks flushed, has just never seen anything this low. Why, how could they? How could anyone dare to ask the question why gays are supporting Beshear? Now I hesitate to say this for fear it might send these people into another fainting spell, but could the support of gays say anything about where Beshear might stand on issues of concern to Kentuckians, like gay marriage and domestic partner benefits at taxpayer funded universities? And the problem of tender constitutions is apparently not just a problem among some in the media corps. Over at the Democratic Party they're in high dudgeon over the fact that Brett Hall published a photo of a Beshear campaign fundraising invitation to the home of openly gay Jefferson County Judge-Executive Ken Herndon which includes the names of several gay "couples". Now wait. I know what you're thinking. You're thinking that if the Democrats just quietly whispered into media ears that Fletcher was receiving support from some right wing group, the media would be blaring it from the housetops without the least trouble to their collective conscience (this is assuming, of course, that they have one), and would be doing everything short of patting the Democrats on the back for doing Kentuckians a public service by pointing it out. Shame on you for thinking such a thing. Shame, shame, shame. These are left-wing groups we're talking about here, and don't forget it. And don't forget either that there are no such thing as left-wing groups like those made up of the people that no one is supposed to notice who are supporting Beshear. There just aren't. And we can prove it. Have you seen any references to them in the media? Huh? And when people bring them up like this and point out that they support one of the candidates who is portraying himself as conservative to Kentucky voters, it makes the media look bad, 'cuz that's something that in any other circumstance they would be covering as a legitimate issue. So listen, before more reporters start losing their composure, let's just all forget that this happened. The Health Care Crisis that Wasn't: What they're not telling you about the "Uninsured"
When politicians start telling you there is a crisis that we, as a society, need to address, it's usually best to let the livestock loose and hide the family in the basement. And take your wallet with you: it's the first thing they'll look for. The issue of the election of 2008 is shaping up to be health care; specifically, the problem of the number of poor people who are uninsured. Hillary has unveiled her health care plan, and Democrats in the U. S. Congress have tried to embarrass Republicans with a bill that would insure children. But what if the problem of the uninsured was overstated by the politicians? It sounds amazing, I know--that politicians would overstate a problem. But there it is. But Robert Martin, Ewing T. Boles Professor of Economics at Centre College (in my hometown of Danville, Kentucky) has come up with some very interesting statistics from the U. S. Census Bureau on the problem of the uninsured that some politicians have (wouldn't you know it), failed to relate to their audiences as they stump the country proclaiming that the end of health care is near. According to the Census Bureau's report, "Income, Poverty, and Health Insurance Coverage in the United States: 2006", there are almost 47 million uninsured people in the United States. But, despite much of the apocalyptic rhetoric propounded by the left, a surprising proportion of the uninsured are not poor, nor are the poor who are insured necessarily U. S. citizens. In addition, the vast majority of the short-term increase in the ranks of the uninsured comes, not from the poor, but from middle class and the rich. 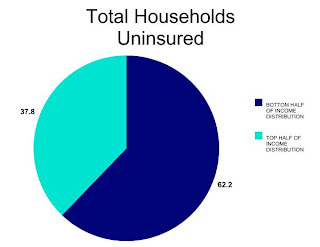 37.8 percent (over a third) of the uninsured in America are in households with incomes in the top half of the income distribution. The likely explanation, says Martin (not me: the real one), is that fewer employers are offering health care insurance. Before this, says Martin, "people signed up for health insurance automatically. Now, they have to elect to purchase health insurance. The data reveals some people with high incomes are choosing not to purchase health insurance." I hate to mention it, since it might give Hillary ideas, but the only way to solve this would be through requiring people to use their money for health insurance rather than something else, but that would violate their right to choose what they do with their money. 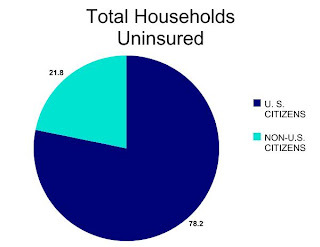 21.8 percent (over a fifth) of the uninsured in America are non-U. S. citizens. According to Martin, the Census Bureau does not keep records on the legal status of non-citizens. But, "If they are illegal aliens, we would not be surprised that they are uninsured." In fact, the number of uninsured non-citizens increased from 2005 to 2006 by 835,000. Martin adds to this fact a telling observation: "[T]he five states with the highest uninsured rates are Texas, New Mexico, Florida, Arizona, and Oklahoma." Go figure. 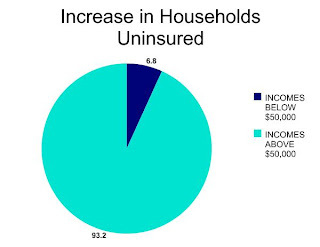 93% of the increase in the uninsured is among those with annual incomes of $50,000 or more. This figure is the change from 2005 to 2006, and so the long-term difference could be different. But it would be interesting to know, over a longer period of time, whether the same holds true:In fact, if it is true that the ranks of the uninsured are not primarily among the poor, but the middle and upper class, then the only way for Democrats to resolve the problem would be to provide some sort of federal assistance for those in higher income brackets. But isn't that what they are always accusing Republicans of doing? The number of uninsured people with incomes of less than $25,000 decreased by about 519,000. The number of uninsured in the Census Bureau's lowest income category decreased from 14,452,000 in 2005 to 13,933,000 in 2006. Of the four income categories used by the U. S. Census, this was the only one in which there was a decrease. And they thought the BCS system of determining the best team in college football was bad. They obviously haven't seen Kentucky's system for determining educational success. The top story in today's Lexington Herald-Leader was on the confusion over the CATS tests. Gee, where have we heard that before. The confusion over the state's testing system isn't new. But it is getting worse all the time. Why do I say this? Let me count the ways. This is not the first time the measuring stick that is used to determine successful schools has been changed. It was also changed in 1999, after the General Assembly, in 1998, shifted the first set of chairs on the deck of the Titanic by taking away some of the consequences for unsuccessful schools, changing the way it graded the tests, and renaming it CATS (It was formerly, "KIRIS"). And let's all remember why they had to do it: because there was another bill that year that would have repealed the entire testing system altogether, which was rocking the Capitol that year, and came within a hair's breadth of passing. Legislators couldn't afford to go home without at least saying that they had changed the test. Well, that and the fact that it was clear that the only progress that was being made by schools was to get students from the Novice to Apprentice category, but little in the way of getting them from Apprentice to Proficient--which was the goal. So in 1999, the Kentucky Department of Education changed the way it the tests were scored. That made comparison with tests from previous years nearly impossible. Now, in 2007, it has been changed again, and comparison with previous years scores has once again been rendered inscrutable. How would you feel if you were headed somewhere in car and someone kept pressing the reset button on your trip odometer? Folks, there is something very wrong here (Wait a minute, I'm getting deja vu again. I could have sworn I've said this before). But wait, it gets worse. Not only is there growing confusion on what test scores mean, but there is increasing confusion about what this test is for. Did anyone notice the comment by Warren County School Superintendent Dale Brown? Or rather, I guess it was the reporter's summary of what he said, so maybe we shouldn't be too harsh. But Brown was basically lamenting that because of the change in the tests, his schools couldn't accurately measure individual student progress because of the adjustment. How does a superintendent get away not knowing that the CATS tests are not for individual assessment? From the inception of KIRIS in the 1990's--despite all the confusion on everything else--there was one fact that everyone agreed on--test developers, legislators, and, presumably, professional educators: KIRIS and CATS were not accurate when measuring individual performance: that the tests were only for the purpose of measuring schools, not students. Ed Reidy, the Dr. Frankenstein of KIRIS, said it repeatedly. Helen Mountjoy, the previous Chairman of the State School Board, who played the Don Quixote role in pressing forward on the tests, said it too. Everyone knew this. Now we have professional educators who think it is useful for individual assessment. The CATS testing system has been on artificial life support for several years now, and the only thing keeping it breathing is that fact that extraordinary means have been taken to keep it alive. Its time someone stepped in to put the sorry thing out of its misery. You are now eligible for transfer to another newspaper since The Herald-Leader is now subject to corrective action under the "No Newspapers Left Behind Act" (NNLBA ) due to the fact that the paper's editorials have been identified as persistently misdirected and nonsensical (not to mention illogical and overly vitriolic--especially when Larry Dale Keeling writes them). We regret to add, however, that the choice provisions under the NNLBA limit your choice of new publishing employers only to other liberal newspapers that are basically indistinguishable from the one you are now working for, meaning that, even if you exercised your right of choice under this Act, you will still be subject to the same droning "Diversity" Newspeak, and possibly even worse coffee in the break room. Oh, and your cubicles won't be any bigger either. We realize that some Herald-Leader employees will wonder how their newspaper came under corrective action under the NNLBA guidelines. Of course, the evidence for the lack of editorial proficiency is produced on a daily basis. But the proximate cause for official sanctions came in last Friday's editorial arguing that because so few parents took advantage of the close to meaningless choice provisions in the No Child Left Behind Act, that therefore school choice policies are ineffective. In Fayette County, of the 6,100 students who were eligible to transfer this year, 173 students took advantage of the opportunity. All this suggests that choice is falling short as a force for improving education. The No Child Left Behind Act's provisions constitute choice in the same way as elections in communist countries were supposed to be "free": you could choose among a number of candidates--all of whom happened to be running as communists. Real school choice plans, of course, allow students to have real options which include private schools. The relevance of what happens when you limit people's choice to only public schools to what happens when you allow them real choice is what really caused the NNLBA to bring closer scrutiny to bear on the paper. School-choice advocates would argue that the way to create true competition is to give families monetary vouchers with which to enroll their children in private schools. But how likely is it that an area that has never produced strong public schools will produce strong private schools? Not very. We had, of course, to rub our collective eyes and read it again, just to make sure we were reading it correctly. The fact that places which have poor public schools commonly have quite good private schools is about as well-established as ... as ... well, as the Herald-Leader's editorial shortcomings. Private schools in Lexington are not bad, and those in Jefferson County, where, with the exception of a few magnet schools, public schools are pretty sorry, are excellent. To use the hopelessness evident within the public school system as an argument against giving parents hope not only violates the provisions of the No Newspapers Left Behind Act (Section 113 A, subsection 5, provision 12--under the section on Stupid Editorial Tricks), it's just not very convincing. Those of you wishing to take advantage of the choice provisions of the No Newspapers Left Behind Act, such as they are, should simply leave your keys in your desk. If you are an editorial writer wishing to take advantage of these provisions, we would encourage you to consult an occupational mobility professional. Which is just our cordial bureaucratic shorthand for saying: do the rest of us a favor and hang it up.